This brand new and multi-use refrigerator & warmer is perfect for home, picnics, camping, fishing trips and so on. It is ideal for drinks, food, fruits, breast milk, medicine. 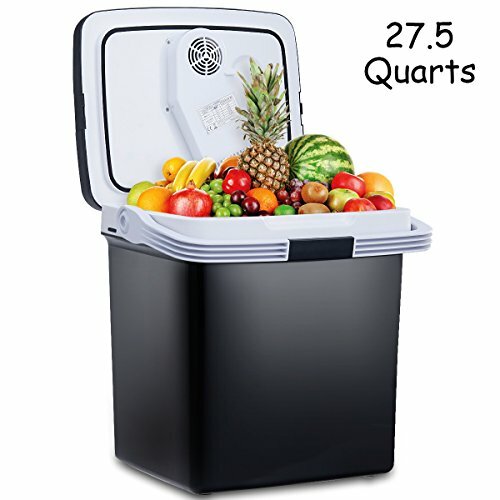 With 27.5 Quarts capacity, it is enough for daily using. The lightweight design and convenient carrying handle allows it to be carried easily. You'll always be able to enjoy fresh food and drinks without having to worry about storage. Dimension: 16" x 13" x 17"
【Enough Capacity and Multi-Use】With 27.5 Quarts capacity, this refrigerator could hold a great amount of drinks and food. You could apply it at home, camping, fishing or vehicles for the 12V DC vehicle outlet and 110V AC home outlet. Appropriate temperature could also be chose for the constant temperature of breast milk, cosmetics or medicines. 【LCD Display】With LCD display and digitized temperature adjustment. It is convenient to adjust temperature. The operation is easy that you could quickly learn how to use it. 【ECO Mode】This mode is much more energy-saving. When your vehicle is in low power mode, you could start this mode. Maybe it take longer to reach colder or warmer temperature. 【Cooler & Warmer】The refrigeration could be low to 64℉and warmer range is 122℉-149℉, which is ideal for food heat preservation, drink refrigeration, fruit refreshment and so on.n, drink refrigeration, fruit refreshment and so on. 【Low Noise Operation】The operation of this refrigerator & warmer is quiet, no need to worry it would bother your camping, sleeping or resting.